Getting something from Point A to Point B – quickly, affordably and safely is what we do best. We do it better than anyone. We have real time experience and this gives us a clear advantage over our competition. Customer satisfaction is extremely important to us and takes top priority. The owner, Darrell Higgins, is available to answer any questions or concerns the client may have. We offer a host of services to take care of all your moving needs. Our workers, helpers, packers and drivers thoughtfully prepare your home to get your belongings from your home to your new destination. Customer satisfaction is extremely important to us and takes top priority. The owner, Darrell Higgins, is available to answer any questions or concerns the client may have. He will come to your residence and address your needs about packing, moving, storage. If you need an estimate he will be able to meet with you and get you an emailed estimate usually within a day or 2 days, at most, under normal circumstances. We run our company with Godly principles and transcendent values. Your belongings will be handled with extreme, care as if they were our own. 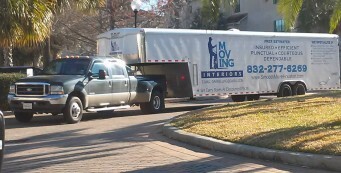 Our Pearland moving and storage company is insured with Pearland Insurance Agency. There is a clear distinction from our competition. We offer a host of services that will take care of all your moving needs. Our workers, helpers, packers and drivers have been around the block, across the state and have seen more than their share of moving and packing jobs. They will thoughtfully prepare your home with a plan to smoothly get your belongings from your home to your new destination. We are family owned by Darrell Higgins. Darrell started and has operated this company for more than 18 years.